Have you ever thought about Surfing internet without data connection? But the question is, how the internet contents is going to be delivered without a data connection? Is it possible to browse Webpages without data connection? The answer is – Yes it is now possible with Cosmos Browser. 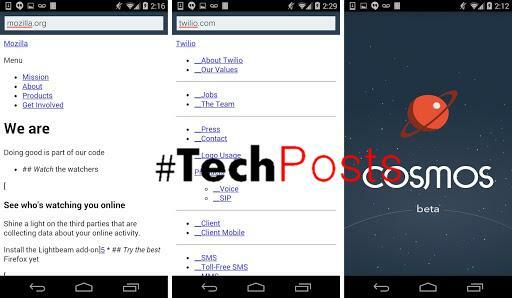 Cosmos is a mobile browser which comes with a new concept of browsing via SMS. As this browser use SMS, hence you don’t need any data or WiFi connection for browsing. Before getting started about the app, I’m sure that this app can and will make a revolution in mobile browsing. Nowadays the data plan rates all over the world is costlier. So this browser works via SMS, hence it surely reach global audience very shortly. Also, you can access Web in the areas where data Connection is not available. Cosmos Browser project was powered by Twilio Cloud Communications, which provides API’s for Voice, VOIP and Text Messaging services. Cosmos browser makes a new concept in browsing experience and it is in early BETA stage and its developers are working on a stable version. As of now this browser was in development for Android and FireFox mobile operating system. The developers are planning for the stable release of the app shortly. To receive updates about the browser subscribe in its official website. Now the cosmos browser will decompress package and display the contents in the browser. You will not get the pictures in the website and the webpage will not aligned correctly as you look in the web, but you will get the essential details from the website. If you’re a developer, browse the details on the how the browser was designed and its periodic updates on its GitHub page. This application was made available in Google Play Store for Android Users, but was removed temporarily due to high volume of SMS received on their servers as reported in their Facebook post. Also they said that they will get back soon with the browser which will be available to all smart phone users very soon. But till then you can download it from Here and Try it. Also write your feedback and questions in the comments below.